Need to improve your water quality? 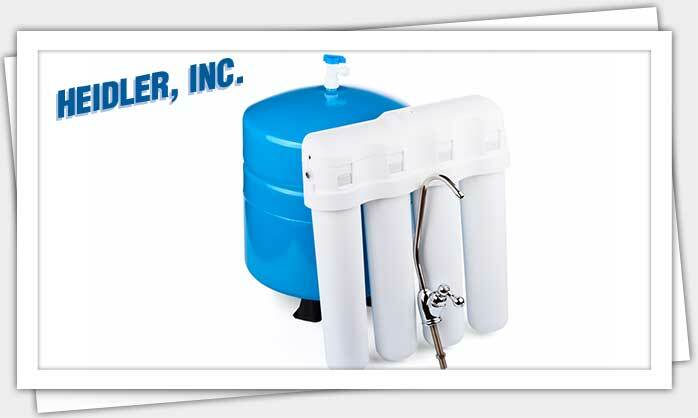 Work with your local Annapolis water filtration experts at Heidler, Inc. Call today at (410) 268-7191 to install the right water filtration system for your home. Click here to view our current discounts and specials. Untreated water reduces the quality of your drinking water supply and speeds up the deterioration of your pipes and fixtures. Solve the problem with a professionally installed water filtration system. There are several options available. We will help you choose the ideal system for your needs. Water filtration systems help remove foul tastes and odors from your drinking water. Sediment and minerals found in untreated water will also be reduced. This means your pipes and fixtures are less likely to suffer from premature corrosion or deterioration—allowing you to enjoy efficient water flow. Installing a water filtration system also helps to extend the lifespan of your overall plumbing system, so you don’t have to worry about repairing or replacing pipes affected by mineral or limescale buildup. Which system should you install? The two most basic systems are carbon and ceramic filtration. Ceramic systems: The ceramic filter blocks sediment and small particles. Carbon systems: Carbon filtration operates by chemically bonding to contaminants, making them easier to remove; such systems can vary greatly in terms of efficiency and cost. These basic filtration systems are often able to meet the needs of most homeowners working with a limited budget. If you are not sure which system best fits your needs, we will help you choose the right one. From simple and cost-effective options to the most advanced filtration available, the system we install for you is guaranteed to provide improved water quality. What is distillation and reverse osmosis filtration? Distillation: Water is heated to steam and then condensed back into liquid form. Reverse osmosis: This filtration method utilizes a membrane to purify water. Both technologies are effective at removing contaminants, sediment, and even waterborne pathogens that pose a health risk. Whether you are interested in budget-friendly systems that provide basic filtration solutions, or more sophisticated options designed to handle a greater range of sediments and contaminants, we can install the right one for you. Our professional installation services make it easy to improve the quality of your drinking water and protect your fixtures and plumbing from mineral deposits and buildup. Not sure which filtration system is best for you? We can help. To enjoy better tasting water straight from the tap, call us today at (410) 268-7191 and learn more about your options.